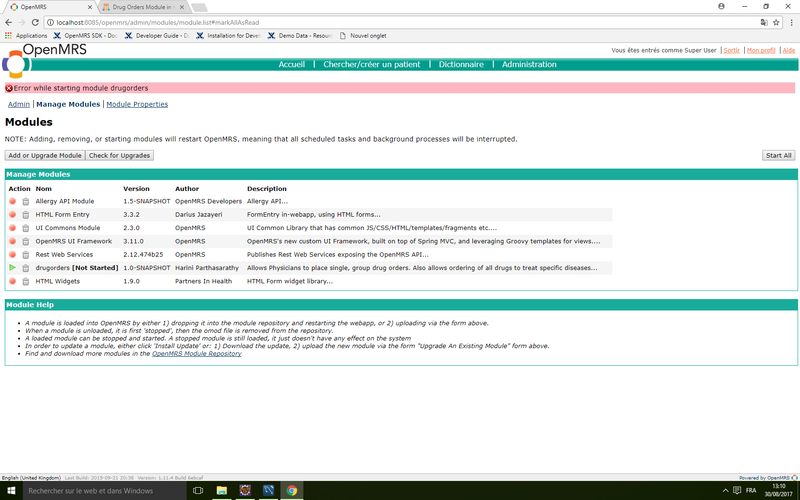 Hello everyone; I’m trying to implement the drug orders module in my OpenMRS 1.11.5; i have successfully installed all the required modules to make this module work, but in vain, the module still lightening in green and no errors are displayed. 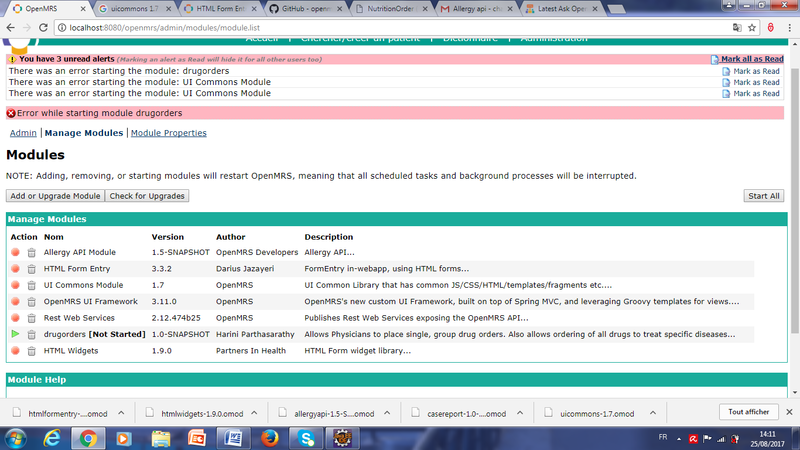 so i can’t work and no errors are shown as in the screen shot below. I don’t understand why?!! it’s a mistake u_u" because in the first publication, i forgot to post the screen shot with the text (i’ll remove the other one thanks for th note). well this is not the problem, i need an answer about the problem i posted here Kindly, Thank you ! This module is compatible with OpenMRS 1.11.4 or version 2.3 on which it was developed. It seems like you are trying to install it on a different version. Before installing the OpenMRS Drug Order and Pharmacy modules, could you please ensure that the following modules are installed. Same issue for me too. Any help is appreciated. @charchabil were you able to resolve the issue? @hariniparth @dailyshelter I found the Alergy API module here (https://github.com/openmrs/openmrs-module-allergyapi). But I couldn’t make the .omod file. If everyone can share or make omod file. Please share with me as well. Pls can you send by mail if possible or any file sharing platform? Need this urgently as dispensing module is not functional.